We all know that protein is essential for muscle growth and fat loss, but you may not know that your protein doesn’t always have to come from animal sources. Plants can be a great source of clean protein—you just have to know what kinds to buy. If you’re tired of constantly firing up the grill for chicken breasts and turkey burgers, try something new! Use these six protein-filled, plant-based recipes to add some new flavors and protein sources to your diet. They’ll help fuel your transformation and keep you feeling healthy and energized! This is one of my favorite summer salads to bring to barbecues or to pot-luck parties. It also serves well for weekly meal planning! This dish isn’t your average green side salad, but has a healthy dose of protein, complex carbs and good-for-you fats. Pair it with lean meat for a complete meal. Bring 2 cups of water and 1 cup dry quinoa to a rolling boil. Boil for 2 minutes. Reduce to a simmer and cover. Allow to cook for another 15 minutes, then fluff with a fork. In a separate small saucepan, boil frozen edamame in water for 5 minutes, or until fully cooked. Once quinoa and edamame are fully cooked, add all ingredients in a large bowl and mix until all flavors are incorporated. This is a filling, hearty veggie dish! Even though there’s no meat, you’ll still need a knife and fork to dig into this meal. Turn on oven to high broil. Add onion and tempeh to pan and saute for 2-3 minutes, or until onion begins to soften. Add quinoa, spices, salt and pepper and saute a few more minutes. On a baking sheet, place portabello mushrooms brushed lightly with olive oil. 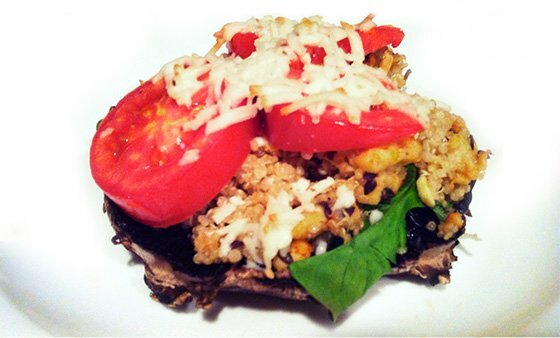 Stack mushroom caps with spinach, quinoa mixture, sliced tomatoes, and shredded cheese. Give yourself a break from grilled meat and throw these ingredients together for an easy and tasty alternative to the usual. 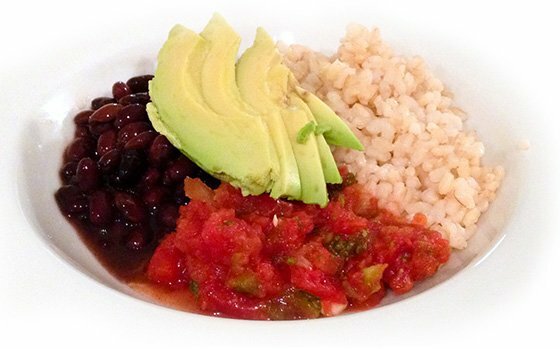 You’ll get all the flavor of a Mexican-restaurant meal without the fried fat and unhealthy calories! This is a great protein-packed meal I love to make for lunch during the week. I usually take whatever vegetables I have in the fridge, stir fry them with some lively spices, and add them to brown rice and tofu. Use whatever veggies you’d like—below are my usual ingredients. Remove tofu from package and press with paper towels to absorb all excess moisture. Chop tofu into cubes and place in large Ziploc bag. In a large saute pan, heat olive oil over medium heat. Add broccolini and bell pepper and stir until lightly softened. Heat another pan to medium heat and add tofu. Cook tofu for 5 minutes, stirring occasionally until all sides get cooked. 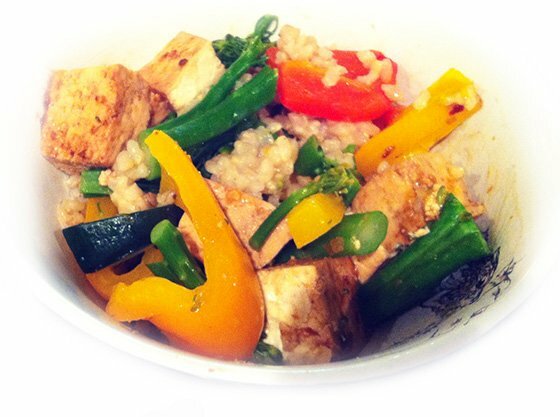 To serve, add 1/2 cup of brown rice and top with tofu, veggies, and green onions. When you’re dieting for a competition, it’s unlikely your nutrition plan allows for pasta. Don’t be sad! This recipe tastes just as good as the real thing—just without all the simple carbs. 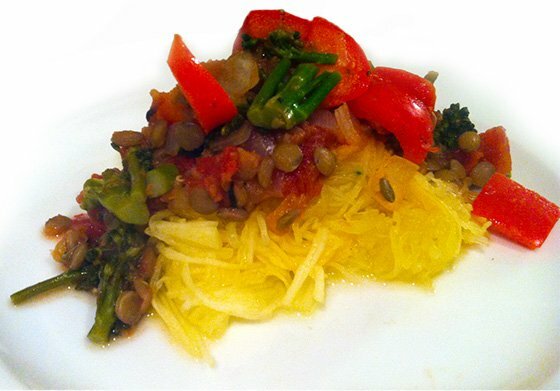 You’ll get some healthy, complex carbs from the lentils and extra veggie goodness from the spaghetti squash. Pierce squash with fork multiple times and bake for 60 min, or until outside is softened. In a large pan, heat olive oil and garlic over medium heat. Add lentils, tomatoes, veggies and spices. Bring to a boil and reduce to a simmer for 15 minutes. While sauce is cooking, scrape out spaghetti squash with fork onto plate. Top with about one cup of lentil marinara sauce. Many people love P.F. 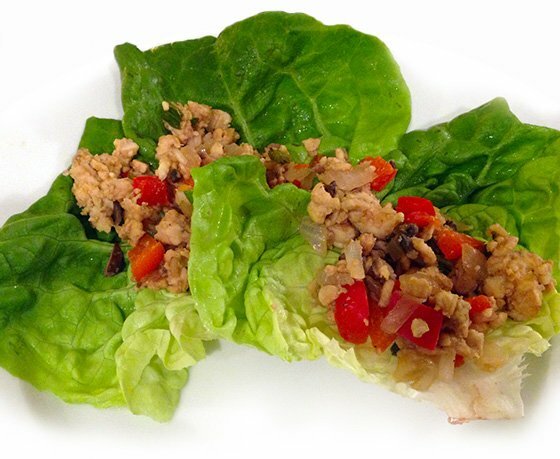 Chang’s chicken lettuce wraps. I was inspired to create a cleaner, meat-free version at home! It is quick and tasty, and a great option for a low-carb dinner. Heat olive and garlic in a large pan over medium heat. Add onion, tempeh, and bell pepper and saute for 3 minutes. Add soy sauce and spices and cook for another 2 minutes. Spoon mixture into lettuce leaves. This entry was posted in Health And Nutrition and tagged Cook, Olive oil, Quinoa, Salad.